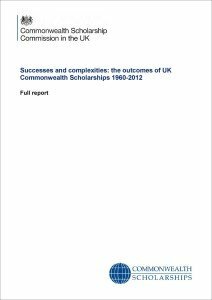 In the Commonwealth Scholarship Commission’s latest report we present a detailed analysis of both the trajectories of individual Scholars through the labour market, and the catalytic impacts that have been generated by their activities. The report is available in abridged and full format from the Commonwealth Scholarship Commission websit e.
Since 2012, the Commonwealth Scholarship Commission in the UK has been conducting a cycle of evaluation surveys designed to generate insight into the experiences, achievements, and difficulties of our alumni. By mid-2015, we had sent a survey to 100% of the members of our alumni network for whom we had current contact details. Almost 2,100 Scholars and Fellows responded to the survey, including participants from each scholarship programme operated by the CSC, residing in 84 countries, having studied over 100 academic disciplines, and having been hosted at over 300 UK institutions. The survey gathered responses from Scholars and Fellows who had held scholarships as far back as 1960 and in every subsequent year until 2012. Findings from the survey are set out in the ‘Successes and complexities’ report, which extends and expands our previous interim report from late-2014. Posted on April 1, 2016 by Matt Mawer. This entry was posted in Higher Education, Scholarships. Bookmark the permalink.